Welcome! Here are full treatments of UK deergrasses ⇒Trichophorum and spike-rushes ⇒Eleocharis, a bit on the hybrid filmy-fern ⇒Hymenophyllum x scopulorum, and a gallery of photos and a discussion page for the Teesdale Violet, ⇒Viola rupestris. Click above, below, or in the menubar, to go to the start-pages. Please let me know (via the contact page): – is it easy to read and extract the information? – what would enhance it? – errors? – broken links – material which is not currently downloadable which you would like to able to download? – other groups I might be able to cover in this format – etc. 4 April 2018: new distribution maps for deergrasses. 2 November 2017: reinstated some corrupted links. July 2016: added a page and a photo of Cotton Deergrass, Trichophorum alpinum (having just located a specimen of it). Abandoned albums from Canon. October 2013: added links to deergrass and filmy-fern albums. 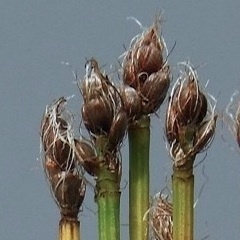 February 2013: added a page/download concerning "Eleocharis mitracarpa", accessed from the sidebar on the spike-rushes start page (link above). 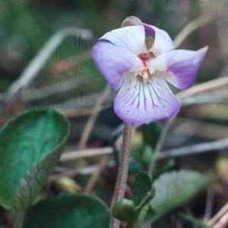 December 2012: added a gallery of photos of Viola rupestris (Teesdale Violet), linked above. April/May 2012: complete layout redesign; separate species pages for deegrasses; more on Eleocharis palustris subspecies palustris; more on Eleocharis hybrids, E. parvula, and photos from a kind contributor for parvula and acicularis., q.v. 10 February 2012: new page in Spike-rushes section on mamillata sensu stricto; previous references to ‘mamillata’ now refer as appropriate to the species mamillata, or to either subspecies mamillata or austriaca; more literature references added; a new small page in Deergrass section; some additions elsewhere. 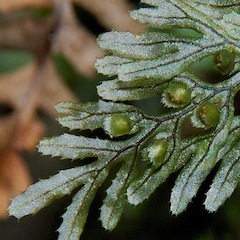 6 January 2012: reference to paper naming new filmy-fern hybrid. 2 January 2012: improving style uniformity across the site. 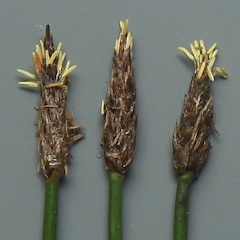 27 November 2011: tweaking; a new page on E. palustris x uniglumis (link from pages ‘Spike-rushes’, ‘palustris’ and ‘uniglumis’). 20 November 2011: a section on Eleocharis – at last! If you wish to use any of the photos herein, please ask me. You are very welcome to copy or download the information content for your own use. Please acknowledge the source if you are making use of it in a wider circle. This site displays well (here) with Firefox and with Chrome. Apple’s Safari inexplicably has problems with font-size in some places. I don’t run any other browsers: let me know of problems you encounter. Created with RapidWeaver on a MacBook Pro (✞) and now iMac.